Low Level Laser Therapy is a form of phototherapy, which involves the application of low power coherent light to injuries and lesions to stimulate healing. Low Level Laser Therapy is used to increase the speed, quality and tensile strength of tissue repair, resolve inflammation, increase range of motion and give pain relief. Cold laser therapy is a major advancement in healing and is rewriting the medical books on what is possible for chronic injuries, pain management, neurological impairment, and facilitating the healing process in disease conditions. The effects of Low Level Laser Therapy are photochemical (cold), not thermal. 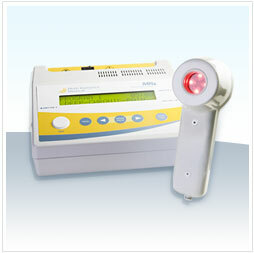 Hot lasers in the medical world are used for surgical precision while cold lasers are used for healing precision. During treatment of the tissue with the laser, an interaction between cells and photons takes place - a photochemical reaction. It is like when the sun shines on plants and the light is turned in to chemical energy and the plant grows. Photons from the laser affect the tissue at the cellular level. The cold laser enters the tissue, alters cell membrane permeability, and at the cellular level is absorbed in the mitochondria. The mitochondria are the "Powerhouse" of the cells and make ATP (ATP is our bodies energy), which is needed for the life enhancement process of every cell. 1. Accelerated cell reproduction and growth. 2. Faster wound healing. The laser stimulates fibroblast development (these are like the building blocks) in damaged tissue. This can help in the reduction of recovery time. 3. Increased metabolic activity. Helps the body increase output of specific enzymes; greater laser induces oxygen to blood cells and more effective immune response. 4. Reduced fibrous tissue formation. The laser reduces the formation of scar tissue following tissue damage from cuts, scratches, burns, or following surgery. 5. Anti-inflammatory action. The laser reduces swelling caused by bruising or inflammation of joints to give improved joint mobility. 6. Increased vascular activity. The laser stimulates lymph and blood circulation to allow the affected tissue to have the best possible circulation. It may help stimulate nerve function. If you have slow recovery or nerve dysfunction in damaged tissue, it can result in "dead" limbs or numb areas. Laser will speed the process of nerve cell reconnection to bring the numb areas back to life. Laser also increases the amplitude of action potentials: to optimize muscle action. These physiological changes affect nerve conduction rates and the energy communication pathways throughout the muscles. The energy transferred to the cell can increase its kinetic energy, and activate or deactivate enzymes or alter physical or chemical properties of macromolecules. Research has shown that the cells of your body actually communicate with each other through coherent light (laser). With the laser there are specific pulsations (hertz) that can be programmed with the laser frequency allowing me to talk “cell talk” with the body. Specific pulsations have been shown to create different physiological responses of the cell. This is extremely important when working with a variety of injury and disease conditions to promote healing. The metabolism of injured and diseased tissue is decreased and the laser creates an increase in metabolism and cell communication immediately. The common response from clients when this safe and effective modality is applied is WOW! Even professional athletes are amazed. The Laser has been found to offer superior healing and pain relieving effects when compared to other electrotherapeutic modalities such as muscle stimulation. The results seem equally untouchable for early stages of acute injuries, and for chronic problems such as knee pain, neck, low back and any joint pain. The Laser can also be used for acupuncture point stimulation. Dr. Ungar is also a licensed acupuncturist and can perform acupuncture upon your request. Low Level Laser Therapy is a universal method of treating muscle, tendon, ligament, connective tissue; bone, neurological dysfunction or damage, and skin tissue. When the laser is applied with metabolic and neurological support, the best results are achieved to organize the nervous system and promote healing. Laser therapy is a major advantage for athletes due to the neurological applications and the extremely fast results that can be achieved. Dr. Ungar has used lasers on professional athletes for years. He traveled on the PGA Tour for 10 years and was also team Physician for the USA Karate Team for 7 years so he’s seen his share of injuries. · Sprains & Strains: neck, low back, knee, elbow, shoulders, and ankles almost any joint. · Acupuncture points and meridian balancing without the needles. · Wound Management: open wounds, pressure sores, post-surgical healing, ulcers, diabetic ulcerations, burns. · Carpal Tunnel Syndrome and more! Please talk to your doctor about the benefits of laser therapy for you.